Plot: America America (The Anatolian Smile), written, adapted, directed, and produced by Elia Kazan (1963). Despite his fateful decision to testify before the House Committee on Unamerican Activities (HUAC) in 1952 (the year he made ‘Viva Zapata!’), Actor’s Studio founder and former American CP member (and anti-Stalinist) Elia Kazan was, for me, one of America’s great film directors. 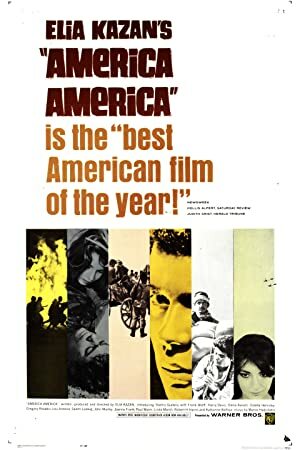 Possibly, his most powerful but overlooked film — one with political relevance in this era of mass migration of refugees escaping war and the brutal repression of political dissidents and religious and ethnic minorities— was his autobiographical 1963 epic ‘America, America’ (‘The Anatolian Smile’ in the UK). The voice-over is spoken by Kazan himself: ‘I am a Greek by blood, a Turk by birth, and an American because my uncle made a journey.’ The film opens with the razing of an impoverished Cappadocian Greek and Armenian village in corrupt Ottoman Turkey in the mid-1890s (the period when Donald Trump’s grandfather was seeking sanctuary — and an edge! — in the US), the home of the film’s Anatolian Greek protagonist, Stavros, and the pitiless slaughter of its terrorised and defenceless inhabitants as they try to escape their Ottoman tormentors. Herod-like, Sultan Abdu'l-Hamid II (a Recep Tayyip Erdoğan role model?) had decreed the empire-wide killing of Armenians (possibly up to 30,000 of whom had already been massacred on Hamid’s orders). This particular holocaust was his response to the 14-hour long occupation in 1896 of the French-British-owned Imperial Ottoman Bank in Constantinople by 28 armed men and women of the Armenian Revolutionary Federation. It was a futile but desperate protest to force the Western European powers to challenge Hamid’s impunity and intercede against his ongoing pogroms and massacres of Christian Greeks and Armenians. The panic-stricken Armenian villagers seek sanctuary in their candle-lit, incense-clouded church where a priest leads them in prayer. Outside, the building is surrounded by Turkish police and Derbendji auxiliaries wielding burning torches. A priest who resists is humiliated and a torch is thrown into the building. Flames and smoke engulf the church and we hear the screams of the dying men, women and children burning alive inside. Kazan cuts to the smoking charred remains of the church; the victims of the state-sponsored massacre litter the streets and we see Stavros crouching by the corpse of his Armenian friend Vartan. In the wake of the massacre Stavros’s family realise there is no hope in Hamidian Turkey for justice or tolerance for Armenian, Azeri, Arab, Assyrian, Greek, Persian and Kurdish minorities. They send him, with the family’s treasures, on a perilous and brutal odyssey by donkey and foot across country to prepare a safer home for the family in Constantinople. Stavros, on the other hand, has a dream of new beginnings, starting over in a new land of promise, America. However, it is the resilient protagonist’s misadventures and moral evolution as he learns to deal with treachery, betrayal, humiliation, violence and corruption on his voyage to the land of freedom that evolve into the great filmic bildungsroman that is ‘America, America’.